The ACM A.M. Turing Award, often referred to as the "Nobel Prize of Computing," carries a $1 million prize, with financial support provided by Google, Inc. It is named for Alan M. Turing, the British mathematician who articulated the mathematical foundation and limits of computing. Hennessy and Patterson will formally receive the 2017 ACM A.M. Turing Award at ACM's annual awards banquet on Saturday, June 23, 2018 in San Francisco, California. "ACM initiated the Turing Award in 1966 to recognize contributions of lasting and major technical importance to the computing field," said ACM President Vicki L. Hanson. "The work of Hennessy and Patterson certainly exemplifies this standard. Their contributions to energy-efficient RISC-based processors have helped make possible the mobile and IoT revolutions. At the same time, their seminal textbook has advanced the pace of innovation across the industry over the past 25 years by influencing generations of engineers and computer designers." Attesting to the impact of Hennessy and Patterson's work is the assessment of Bill Gates, principal founder of Microsoft Corporation, that their contributions "have proven to be fundamental to the very foundation upon which an entire industry flourished." 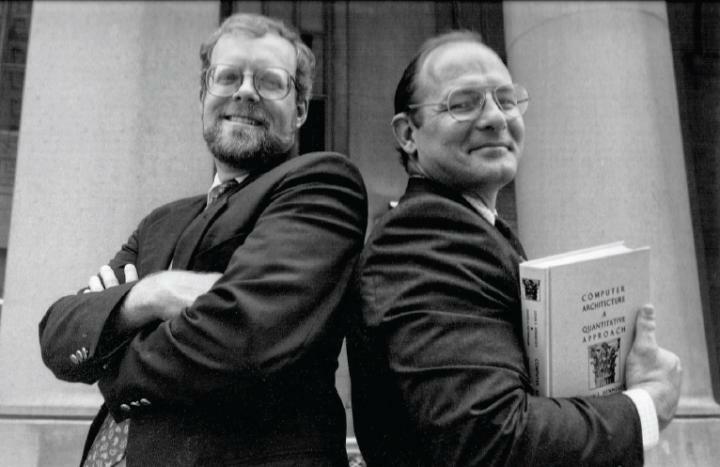 While the idea of reduced complexity architecture had been explored since the 1960s–most notably in the IBM 801 project–the work that Hennessy and Patterson led, at Stanford and Berkeley respectively, is credited with firmly establishing the feasibility of the RISC approach, popularizing its concepts, and introducing it to academia and industry. The RISC approach differed from the prevailing complex instruction set computer (CISC) computers of the time in that it required a small set of simple and general instructions (functions a computer must perform), requiring fewer transistors than complex instruction sets and reducing the amount of work a computer must perform. Patterson's Berkeley team, which coined the term RISC, built and demonstrated their RISC-1 processor in 1982. With 44,000 transistors, the RISC-1 prototype outperformed a conventional CISC design that used 100,000 transistors. Hennessy co-founded MIPS Computer Systems Inc. in 1984 to commercialize the Stanford team's work. Later, the Berkeley team's work was commercialized by Sun Microsystems in its SPARC microarchitecture. John L. Hennessy was President of Stanford University from 2000 to 2016. He is Director of the Knight-Hennessy Scholars Program at Stanford, a member of the Board of Cisco Systems and the Gordon and Betty Moore Foundation and Chairman of the Board of Alphabet Inc. Hennessy earned his Bachelor's degree in electrical engineering from Villanova University and his Master's and doctoral degrees in computer science from the State University of New York at Stony Brook. Hennessy's numerous honors include the IEEE Medal of Honor, the ACM-IEEE CS Eckert-Mauchly Award (with Patterson), the IEEE John von Neumann Medal (with Patterson), the Seymour Cray Computer Engineering Award, and the Founders Award from the American Academy of Arts and Sciences. Hennessy is a Fellow of ACM and IEEE, and is a member of the National Academy of Engineering, the National Academy of Sciences and the American Philosophical Society. David A. Patterson is a Distinguished Engineer at Google and serves as Vice Chair of the Board of the RISC-V Foundation, which offers an open free instruction set architecture with the aim to enable a new era of processor innovation through open standard collaboration. Patterson was Professor of Computer Science at UC, Berkeley from 1976 to 2016. He received his Bachelor's, Master's and doctoral degrees in computer science from the University of California, Los Angeles. Patterson's numerous honors include the IEEE John von Neumann Medal (with Hennessy), the ACM-IEEE CS Eckert-Mauchly Award (with Hennessy), the Richard A. Tapia Award for Scientific Scholarship, Civic Science, and Diversifying Computing, and the ACM Karl V. Karlstrom Outstanding Educator Award. Patterson served as ACM President from 2004 to 2006. He is a Fellow of ACM, AAAS and IEEE, and was elected to the National Academy of Engineering and the National Academy of Sciences.